For the later ironclad warship, see Ottoman ironclad Mahmudiye. 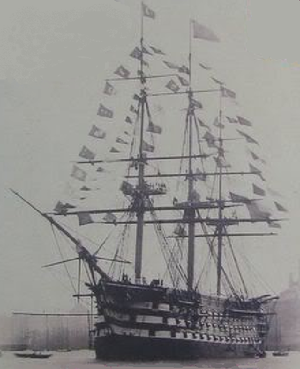 The 201 × 56 kadem (1 kadem = 37.887 cm) or 76.15 m × 21.22 m (249.8 ft × 69.6 ft) ship of the line carried 1,280 sailors on board. She was a 120-gun ship of the line, with guns ranging from 3-pounders to massive 500-pounders that fired stone shot. These guns were mounted on the broadside across three decks. At the time of her completion, she was the largest sailing ship ever built. She was constructed by the naval architect Mehmet Kalfa and the naval engineer Mehmet Efendi on the order of Mahmud II (reigned between 1808–1839) at the Imperial Arsenal, on the Golden Horn in Constantinople. At the outbreak of the First Egyptian–Ottoman War in 1831, prompted by the Egyptian invasion of Palestine, Mahmudiye was already in poor condition, despite being only a few years old. Much of her hull was dry-rotted, though she still served as the Ottoman flagship during the war. During the war, the Ottoman fleet, along with a squadron from the British Royal Navy blockaded the main Egyptian naval base at İskenderun. This included a long-range bombardment on 18 August 1831. The war ended in 1833 following the intervention of Russia on behalf of the Ottoman government and pressure from Britain, France, and Austria on Egypt to withdraw, but unresolved tensions between the Eyalet of Egypt and the central government resulted in the Second Egyptian–Ottoman War of 1839–1841. After the death of Sultan Mahmud II on 1 July 1839, an internal power struggle resulted in the installation of the pro-Russian Husrev Pasha under Sultan Abdulmejid I. On 4 July 1839, the commander of the Ottoman fleet, displeased over the Russian influence in the new government, decided to take the bulk of the Ottoman fleet, including Mahmudiye, over to the Egyptian side. He set sail for Beşik Bay, where an international fleet composed of British, French, and Russian warships was present. With assistance from the pro-Egyptian French, he then moved the fleet to Kos, where he entered into negotiations with Egypt to accept the fleet at İskenderun on 14 July. A year later, in July 1840, the British issued an ultimatum for Egypt to return the ships and surrender the Levant to the Ottoman government; the Egyptians refused, and so the Royal Navy bombarded all of the major ports in the region, culminating in the Bombardment of Acre on 1 November. This forced the Egyptians to capitulate, and on 27 November Mahmudiye and the rest of the Ottoman ships were released to return to Constantinople. Mahmudiye participated in the Siege of Sevastopol (1854–55) during the Crimean War (1854–56) under the command of Admiral of the Fleet Kayserili Ahmet Pasha. She was honored with the title Gazi following her successful mission in Sevastopol. With the introduction of steam power at the end of the 1840s, the conversion of the pure sail-driven ship into a steamer was considered. On inspecting the hull in Britain in the late 1850s, however, it was discovered to be badly rotted, and not worth reconstructing. The machinery that had been allocated to Mahmudiye was instead installed on the frigate Mubir-i Sürur. During the Russo-Turkish War of 1877–1878, Mahmudiye was placed into service as a troop transport, as the government lacked sufficient transport ships. The ship's great size made her an effective transport, owing to her ability to carry a large number of troops. On 27 December, four Russian torpedo boats attacked Mahmudiye and the ironclad Asar-i Tevfik while they were moored in Batumi, but all of their attacks missed. ^ Kadem, which translates as "foot", is often misinterpreted as equivalent in length to one imperial foot, hence the wrongly converted dimensions of "201 × 56 ft" or "62 × 17 m" in some sources. Daly, John C. K. (1991). Russian Seapower and ‘the Eastern Question’ 1827–41. Annapolis: Naval Institute Press. ISBN 1557507260. Ufford, Letitia W. The Pasha: How Mehemet Ali Defied the West, 1839–1841. Jefferson: McFarland. ISBN 0786428937. Bulgurcuoğlu, Hacer. Efsane Gemi Mahmudiye Kalyonu. Deniz Kuvvetleri. Bulgurcuoğlu, Hacer (2007). "Türk Deniz Harp Tarihinde İz Bırakan Gemiler, Olaylar ve Şahıslar". Piri Reis Araştırma Merkezi Yayını. İstanbul: Deniz Basımevi (8). ISBN 975-409-452-7. İşcan, Nejat (2000). Fotoğraflarla Mahmudiye. İşcan Yayınları. p. 35. ISBN 978-975-96495-7-9.